How do you even begin to not just recover, but wrap your head around your new life when something like that happens? I can’t imagine. I remember hearing Brandi’s story on the news, it was so tragic and horrible. I would be bitter, angry and well let’s just say it not a very nice person after having gone thru that. Not Brandi. She is by far one of the most positive people I have ever met in my life. Yes, her life is different and challenging, but whose isn’t she says? She can’t stand whiners, understandably so. She is a Gypsy Sister that everyone should aspire to be ~ positive, hard working, self reliant and funny as hell. I sat down with Brandi, while she was designing her new shoe for Gypsy Soule. 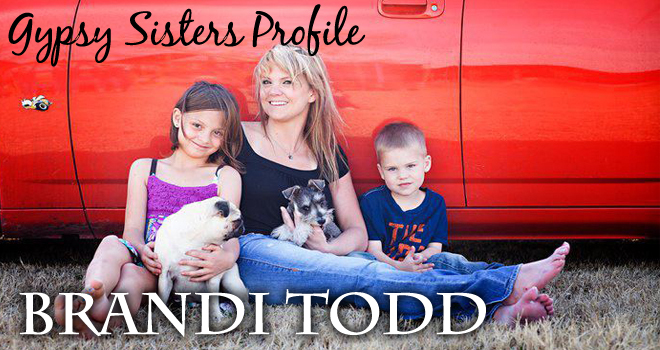 Portions of the proceeds from the sale of the shoe go to The Brandi Todd Medical Fund. I haven’t seen the final product yet, but the girl has great taste as well!!! As always, we asked her our ’sister questions’ and here is what she had to say. Because everybody is different and you can’t apply someone else’s rules to your life. What works for one person doesn’t necessarily work for you. Assuming that my family was safe, pictures. I would want to get all of my pictures out. A nurse or a doctor. My Nana is a nurse and I spent summers with her. I just grew up wanting to be her. Women who have vision and go after what they want. Strong women who are also able to hold on to their compassionate side, who aren’t cut throat. Women who are still human while making their dreams come true. 7. What is the hardest thing about being a woman in your industry? I have never had any major issues at work because I am a woman, although men can be somewhat condescending towards women. I am reading the Hunger Games right now, but I have been so busy that I haven’t had a chance to finish it yet. Whining and complaining about small problems I would trade you for. 10. What is the most memorable day of your life? Right now, it’s the day I got stabbed – As time goes by I think other days will take its place. Before the stabbing it was the day my children were born. 11. What’s on your DVR? 12. What’s on your IPOD? 14. After a bad day what do you do to wind down? Yard work, getting outside, in the pool with a glass of wine always helps. 15. After a good day what do you do to celebrate? 16. If you could have dinner with any four people alive or dead, who would they be? 17. Favorite thing to do on a rainy Saturday afternoon? 18. What do you see as your biggest challenge in life? Finding a balance between work, therapy, my kids and having some me time. 19. What is the best advice you have been given, and who gave it to you? My Poppa always told me to trust in God. There is something bigger than you and in the end it will all be okay and that is comforting. And don’t forget Gypsy Sisters ~ when your local store and you purchase The Crazy Brandi a portion of the funds go back to her medical and rehab expenses! This entry was posted in Giving Gypsy and tagged Brandi Todd, Crazy Brandi, Giving Gypsy by admin. Bookmark the permalink.